You are here: Home » Opinions » China’s White Paper on Tibet, 2015: The Case of an Empty Vessel? 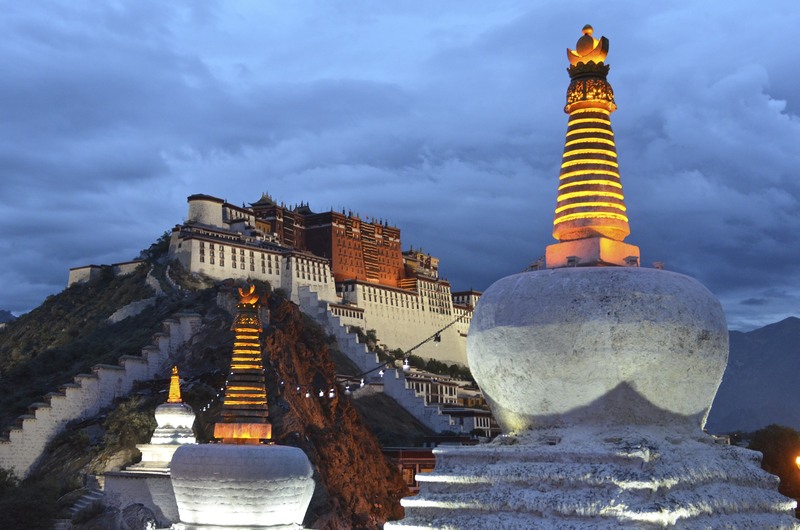 China’s White Paper on Tibet, 2015: The Case of an Empty Vessel? The Potala Palace in Lhasa, Tibet was the chief residence of the Dalai Lama until the 14th Dalai Lama had to flee to India in 1959. (TibetanReview.net, Apr23, 2015) – China has just released a new white paper on Tibet titled ‘Tibet’s Path of Development is driven by an Irresistible Historical Tide’. More interesting than the white paper are the numerous news reports on it in the Chinese media. The headlines are very catchy and give us a sense about the emphasis and exhortations. Out of 92 white papers on various issues, 11 deal specifically with what Beijing considers are concerns related to its Tibet policy. The white papers as propaganda or an outreach tool have been supplemented with annual delegation tours since 2009 that visited various countries, mostly in the Americas and Europe where there is seemingly greater support for the Tibet issue. Without doubt, they are belated efforts to counter and replace the to-some-extent effective Tibetan campaigns internationally. However, we are also able to get a glimpse into how the Tibet issue is being played out on the international stage by the various stakeholders to the detriment of closer Sino-Tibetan understanding. The latest white paper basically begins with the usual rhetoric against old Tibet and feudal serfdom and how the democratic reforms in Tibet since 1959 (that is after the Dalai Lama’s escape to India) has changed the course of that history. Interestingly, an investigation conducted by a Chinese think-tank (Beijing Gongmeng Consulting Co., Ltd) in 2009 reported that a new aristocratic class had emerged in Tibet that was ‘worse’ than the old one. According to them, the new aristocracy had survived in Tibet, unlike elsewhere in China, owing to their absolute loyalty to Beijing. There are many places where the white paper’s citation of facts and references do not necessarily substantiate the arguments. A lay reader could easily get lost in the maze of facts and details. For instance, at one place, it argues that the current Tibetan leadership in exile ‘[i]nstead of acknowledging the ruthlessness and cruelty of theocratic rule, they pine for the old system and dream of resurrecting it in Tibet one day’. It cites certain sections of the 1963 Tibetan Constitution/Charter in exile, and the amendments of 1991, 1992 and 2011 to make its case. A closer reading of the Tibetan Charter and amendments to it reveal the finer nuances that the white paper seems to have missed. Seeking to follow ‘principles laid down by Lord Buddha’ (1963), or establishing a ‘dual system of government based on a Federal Democratic Republic’ (1991), or emphasis on ‘spiritual values’ (1992) do not imply restoration of an old thinking or system. Further, the white paper mistakenly mentions that the 2011 amendment ‘stipulated that the future polity of Tibet would be “a combination of political and religious power”’. Actually, the amendments were meant to fulfil exactly the opposite objectives, that is, to separate church from the state in a more classical sense. As a part of the devolution/democratisation exercise initiated by the Dalai Lama himself, the amendments in 2011 were carried out in order to transfer and ‘reassign’ the Dalai Lama’s political authorities to the democratically elected Tibetan parliament in exile and its head, the KalonTripa, later renamed as Sikyong. Notwithstanding, if the writers of the white paper had read the 1992 document carefully, it made a very important decision that the Chinese government seems to be concerned about viz. The Dalai Lama’s plans to restore serfdom in future Tibet. It stated that the ‘present Tibetan Government-in-Exile will be considered dissolved ipso facto’ and that ‘no one will be entitled to special privileges by virtue of his/her position in the Tibetan Administration in exile’. The thrust of the white paper seems to be to discuss, or rather, denounce the Dalai Lama’s ‘middle way approach’ (MWA) which has been tackled in one full section separately. The white papers in that sense have come a long way from looking at the ‘Dalai clique’ as a group synonymous with that seeking ‘Tibet independence’, even as late as 2008. It is interesting to see how it has now come to see the ‘Dalai clique’ as being synonymous with those espousing the MWA. Both the Chinese views, in that sense, are inadequate in factoring the diversity of actors within the Tibetan community. Notwithstanding this lacuna, the aforementioned discussion gives us a sense about how the Tibet issue has gradually been marginalised by the Chinese side. Whether this was made possible entirely by Beijing’s strategy of stonewalling the issue or it was complemented by the Dalai Lama and the Central Tibetan Administration (CTA)’s unrelenting commitment to the MWA is debatable. Further, contrary to the white paper’s argument, the current MWA that is encapsulated in the Memorandum on Genuine Autonomy (2008) does not envisage Tibet as an ‘international zone of peace’ or as ‘buffer between China and India’, as had been done in the earlier proposals. The memorandum also does not envisage ‘return(ing) the Han people who have migrated into Tibet back to China’ as alleged in the white paper. While expressing concern about the ‘induced massive movement of primarily Han but also some other nationalities into many areas of Tibet’, the Memorandum clarifies that ‘it is not our intention to expel the non-Tibetans who have permanently settled in Tibet and have lived there and grown up there for a considerable time’. It basically demands the ‘right of autonomous areas to work out measures to control “the transient population”’. Such has been in practice in the Indian states of Arunachal Pradesh, Nagaland and Mizoram for a long time. One is left wondering about China’s strategy for Tibet, as well as the Dalai Lama, even after going through such a lengthy white paper. Chinese denouncement of the MWA would definitely bolster the position of the Dalai Lama’s detractors. It is high time that the Chinese side as well as the Dalai Lama side recognise the naysayers as important stakeholders and actors in the Sino-Tibetan equation. Amidst the efforts to reach out/campaign, another important actor that gets excluded are the Tibetans inside China. But that is a much more complex discussion for another time. * Tshering Chonzom Bhutia is an Associate Fellow at the Institute of Chinese Studies, Delhi, India.